Lorne Berggren, a successful Toronto-area businessman, has contributed $100,000 to establish a scholarship at the University of New Brunswick. The Lorne Berggren Scholarship supports students in the mechanical engineering program who have an interest in entrepreneurship. “UNB gave me the head start I needed to get my companies off the ground, and it is my hope that this scholarship will encourage future generations of mechanical engineering students to further their education and become influential leaders in business and the community,” said Berggren. Berggren is the founder and CEO of Mould-tek Industries Inc. and Berg Chilling Systems Inc., two companies he started shortly after graduating from UNB in 1956. Under his direction, these companies have become national and world-wide leaders in plastics materials-handling equipment and industrial process cooling systems. 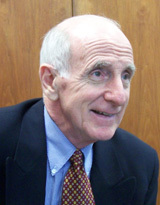 In recognition of his accomplishments, Berggren received a Lifetime Achievement Award in 2007 from the Canadian Plastics Industry Association, as well as the Canada Export Award in 1998. This year’s recipient of the Lorne Berggren Scholarship is Timothy Wilson of Hunter River, Prince Edward Island. Wilson is a fourth-year mechanical engineering student at UNB Fredericton. UNB President Eddy Campbell says the scholarship benefits both students and the university as a whole. “As an industrious entrepreneur and UNB graduate, Lorne has maintained strong ties to this University, and we’re very grateful for his generous donation and continued support of UNB,” said Dr. Campbell. The University of New Brunswick awards more than $4 million in scholarships every year, ranging in value from $500 to $50,000, thanks in large part to donations from generous alumni. In 2009-2010, one in every two incoming high school students starting their studies at UNB received a scholarship. Established in 1785, UNB is one of the oldest public universities in North America. With more than 12,500 full- and part-time students from more than 100 countries, UNB has the best student-to-faculty ratio of Canada’s comprehensive universities, according to Maclean’s magazine. As the largest research institution in New Brunswick, UNB conducts more than 75 per cent of the province’s university research and has more than 60 research centres, institutes, groups and major projects.